As the designer conceptualized this space, it became apparent that much of the saltillo tile flooring used throughout the home, would need to be replaced to define this space and add texture and warmth. A hand hewn, wide plank white oak was selected for durability and casual elegance. The flooring would be the foundation for a blend of gray and soft butter tones. The stylish yet relaxed interior was reflected in the neutral fabric, rich wood tones and combined metal elements of the occasional tables. The area rug in the seating area is made from woven gray leather, which complements the area rug under the dining table made from luxurious wool in a weave of gray, charcoal and black. The soft colors on the walls have a chameleon effect, as they play with the light providing different tones and shadows throughout the day and night. 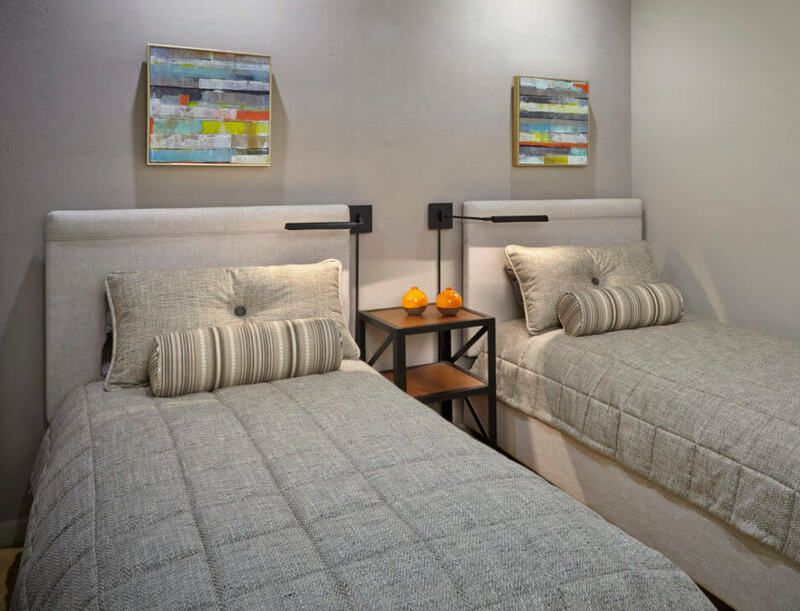 Symmetry in the layout was appropriate for the architecture of the space and appealed to the client’s intrinsic comfort with uncluttered surroundings. 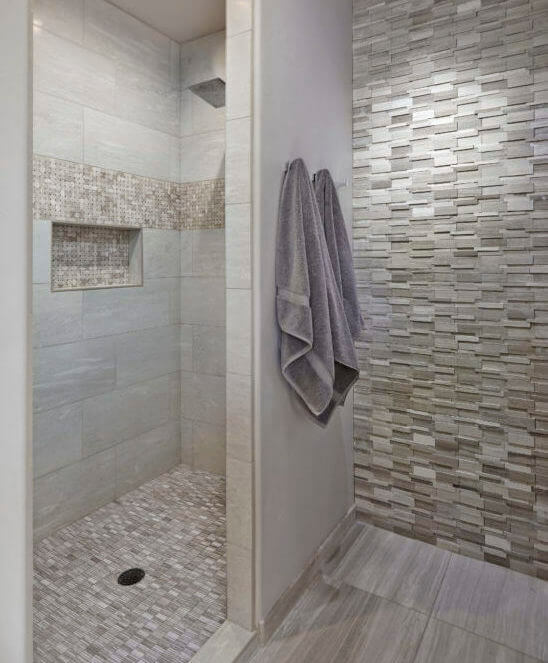 A stack travertine feature wall was installed just outside the shower to repeat tones seen in the shower but with a unique combination of materials. 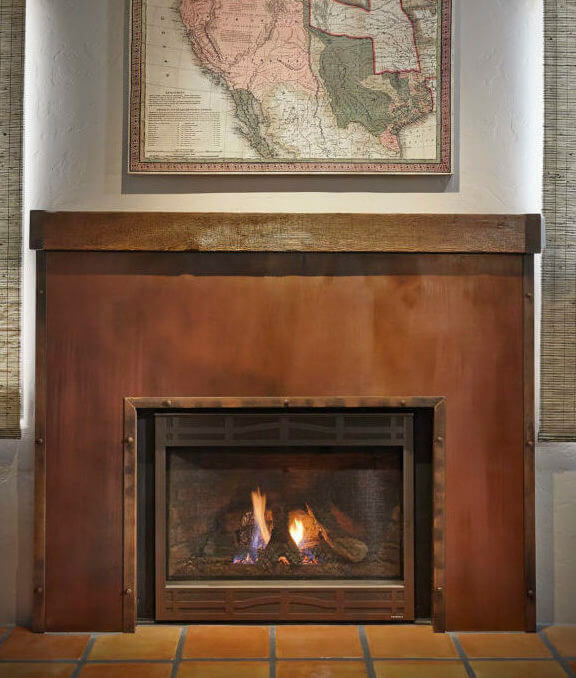 This fireplace façade is a minimalist interpretation of a rustic southwestern inspired design feature. The corner and edge details, as well as the end caps on the mantle, are key to the design of this remodeled fireplace. 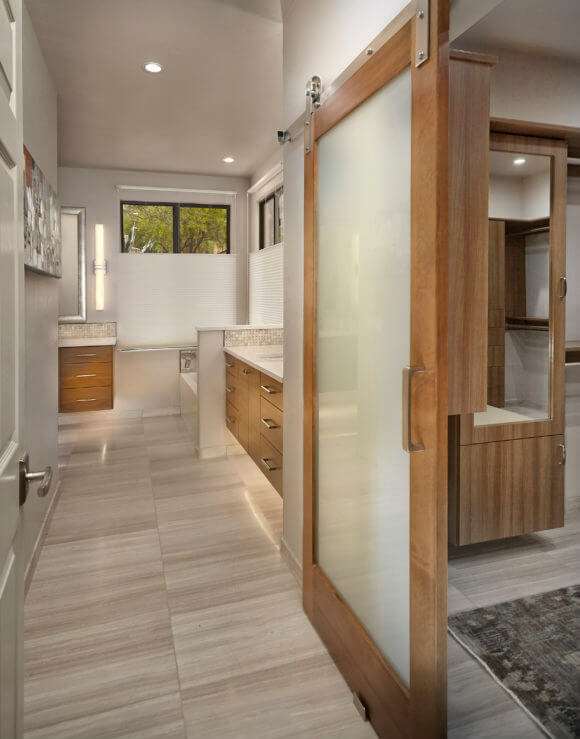 A barn door fabricated from alder stained to match the cabinetry and sandblasted glass, was used both as a low impact closet door as well as an interesting design feature. The perfect entertaining space or simply an intimate retreat, this space is neither too vast or too uncluttered.